This beautiful cortijo has been fully reformed to a very high standard with a modern and contemporary feel whilst maintaining many traditional features, such as exposed beams and wordburning fireplace. 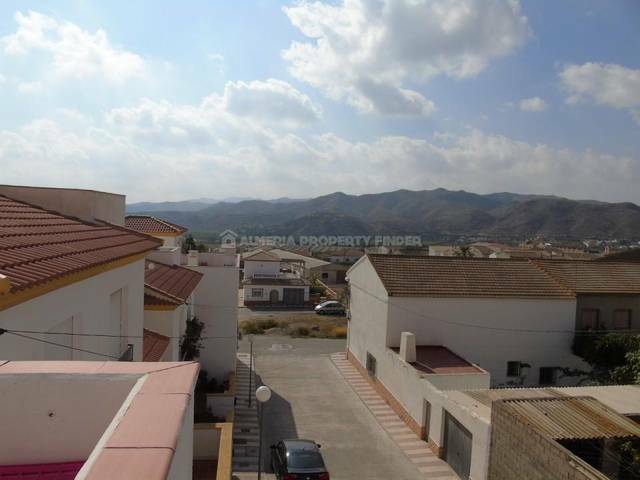 This property measuring 278m² is located in a quiet hamlet called El Prado just outside the market town of Arboleas. In the town you will find all your daily amenities, including bars, restaurants, shops, supermarkets, banks, pharmacies and even a weekly market. As you enter this fabulous cortijo you find yourself in a fully fitted kitchen/diner with a very contemporary look. An arch leads you to the first of 2 living rooms where you have a fantastic woodburner feature, and from here another door leads to what is currently a storeroom but could easily be transformed into a double bedroom. A small set of stairs leads to the main living room which really is vast with arched ceilings, beautiful exposed beams & spotlights. A staircase leads upstairs to a wooden floored landing where you have the main bathroom with bath & separate shower cubicle. Opposite the bathroom is the first of the double bedrooms with access to the very private and enclosed terrace. A door leads from here to both the master and 2nd double bedroom. The master bedroom also includes an en-suite bathroom and access to the main terrace which enjoys beautiful country views. In summary, this is a must see property and at the current asking price wont be around for long.